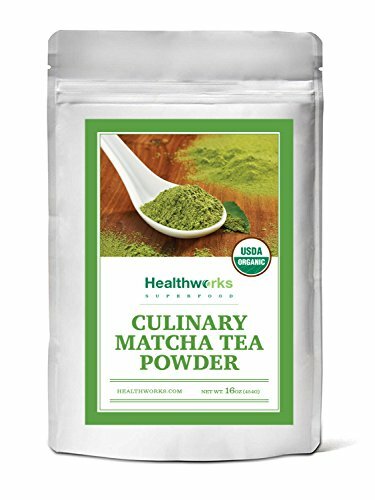 Healthworks Organic Culinary Matcha Green Tea is consciously harvested and handcrafted, with the highest-quality tea leaves, to provide a finely grounded, green powder for all your cooking needs! A scoop of Healthworks Matcha Tea powder will bring zen and outstanding flavor to your favorite recipes. Using Matcha powder is an easy and simple way to add powerful health benefits to any dish or drink. Matcha delivers a mega dose of antioxidants with every sip. It is also rich in EGCg, fiber, chlorophyll, vitamin C, selenium, chromium, zinc, magnesium & more! Healthy and delicious - add Matcha Green Tea Powder to your diet and reap the benefits! TRY WITH: Desserts, Baked Goods, Blended Drinks - like Lattes & Smoothies & More! A treat you will surely love - Healthworks Certified Organic Culinary Matcha Green Tea is consciously harvested and handcrafted, with the highest-quality tea leaves, to provide a finely grounded, green powder for all your cooking needs! A nutrient dense energy boost - Matcha delivers a mega dose of antioxidants with every bite. It is also rich in EGCg, fiber, chlorophyll, vitamin C, selenium, chromium, zinc, magnesium & more! Many ways to enjoy - A scoop of Matcha tea powder will bring zen and outstanding flavor to your favorite recipes. Try our Matcha in desserts, baked goods, blended drinks, & more! Using Matcha powder is an easy and simple way to add powerful health benefits to any dish! If you have any questions about this product by Healthworks, contact us by completing and submitting the form below. If you are looking for a specif part number, please include it with your message.